And its corollary—The trend is no friend at the end of the trend. But how do you find the trend in the first place? Look at a chart of the Dow Jones Industrial Average for the last 100 years and it’s easy to spot the overriding trend—up—but that’s not necessarily going to help you trade or manage your portfolio. In that 100-year period there have been numerous up and down trends, some lasting years and even decades. Trends occur across all different time frames, and it’s often said that the earlier you spot a trend, the more opportunity you may have to capitalize on it. But that’s easier said than done. There are, however, a number of indicators you can use to identify possible trends, such as linear regression, price envelops, ADX and Keltner channels, but here are three of the more popular ones: Moving Averages, Moving Average Convergence/Divergence (MACD) and Parabolic SAR. Moving averages are based on the Simple Moving Average (SMA), which is calculated by totaling the closing price of a security over a set period and then dividing that total by the number of time periods. The periods used for the calculation could be anything from minutes to years. The SMA gives equal weighting to each time period, which makes it well-suited for identifying longer term trends. If the security is above the moving average and the moving average is going up, it's an uptrend. 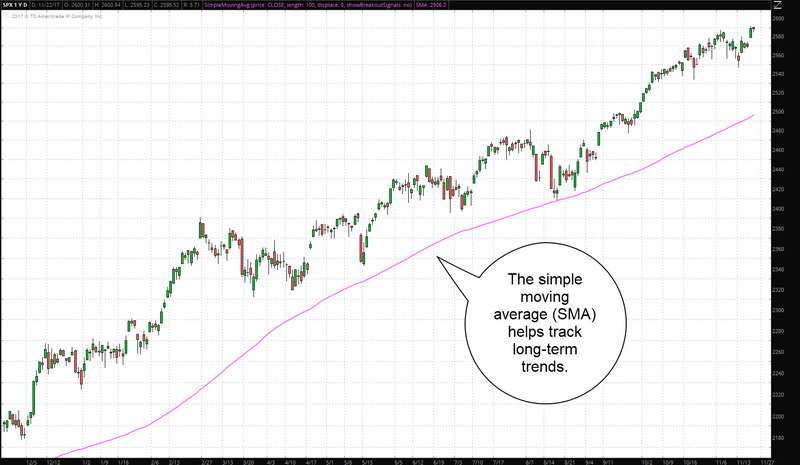 If the stock is trading below an uptrending moving average, it's still an uptrend, but it's weakening. A downtrend occurs when the price is below the moving average and the moving average is pointing down. FIGURE 1: SPX WITH 100-DAY SMA. Chart of the S&P 500 Index (SPX), with the 100-day simple moving average plotted below it (purple). Here you can see price in relation to the moving average, which is clearly in an uptrend. Image source: The thinkorswim® platform from TD Ameritrade. For illustrative purposes only. Past performance does not guarantee future results. The Exponential Moving Average (EMA) differs from the SMA in that its calculation assigns more weight to recent prices, making it more responsive to short-term price action. 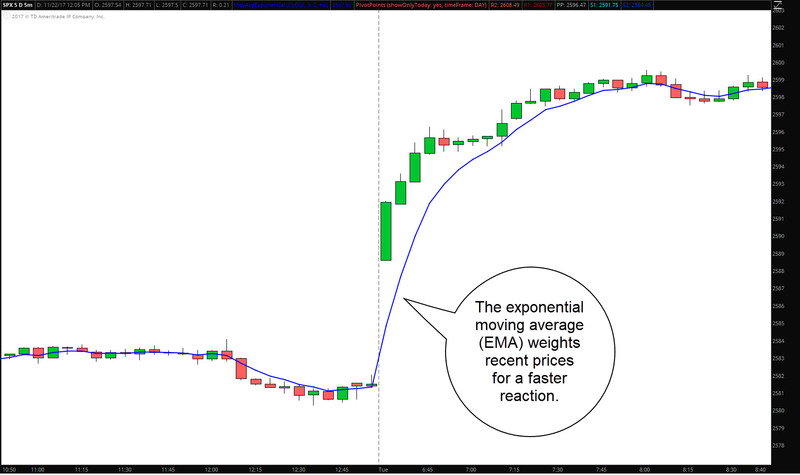 Thus, the EMA is one favorite among many day traders. FIGURE 2: SPX INTRADAY WITH 5-MINUTE EMA. In this intraday chart of the SPX you can see a 5-minute exponential moving average (blue) and how it quickly adjusts to price action. Image source: The thinkorswim® platform from TD Ameritrade. For illustrative purposes only. Past performance does not guarantee future results. The type of moving average and time periods you might choose will depend on your preferred trading style and time horizon, so you might want to experiment with them to see which is optimal for your purposes. 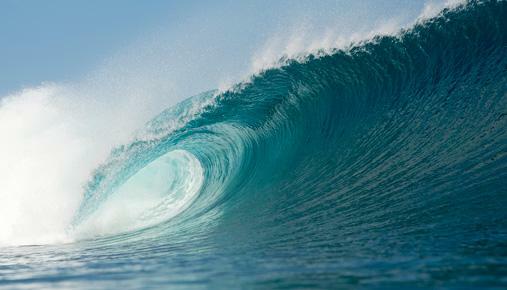 Want to experiment without the risk? 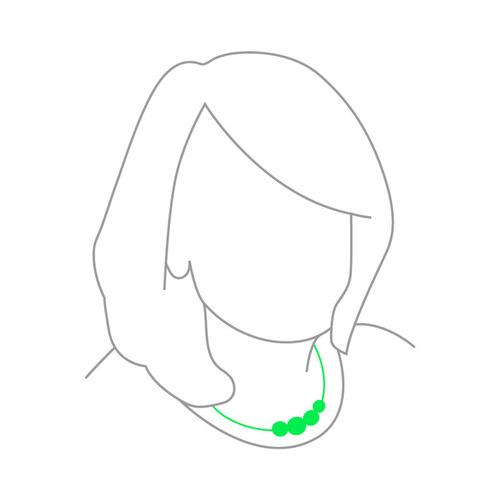 TD Ameritrade clients can practice with the paperMoney® simulator. The Moving Average Convergence Divergence indicator, or MACD as it is commonly called, combines both trend identification and timing into one tool. The MACD belongs to a group of technical indicators called oscillators, because they tend to move back and forth from one side to the other over a period of time. The MACD is built on the idea that when moving averages begin to diverge from each other, momentum is generally thought to be increasing, and a trend may be starting. Traditionally, the MACD takes two EMAs – the 12 and 26 period – subtracts the shorter from the longer, and plots it on a chart. Then a 9-period average of the MACD itself is plotted, thereby creating a signal line. When that signal line crosses up above the indicator line, it indicates that an upward trend may be starting, and when it crosses below, that may signal the start of a downtrend. FIGURE 3: SPX DAILY WITH MACD. 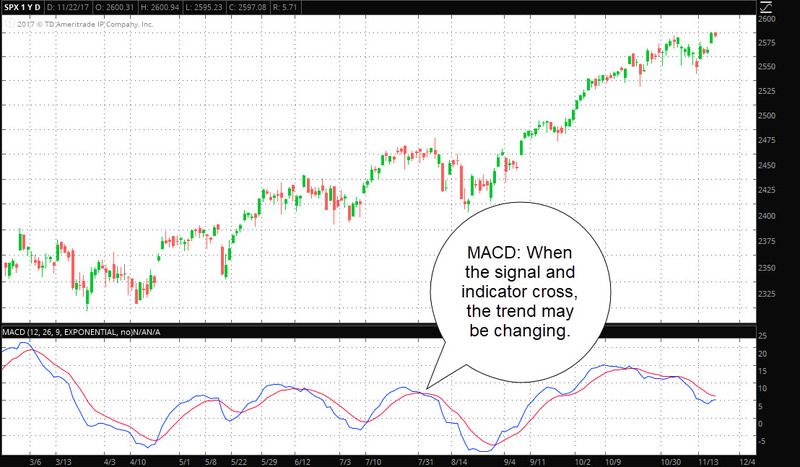 The Moving Average Convergence Divergence (MACD) indicator is plotted in a separate panel below the SPX. As the signal line (red) crosses above and below the indicator line (red) you can see the changes in trend. Image source: The thinkorswim® platform from TD Ameritrade. For illustrative purposes only. Past performance does not guarantee future results. Though the 12-26-9 configuration is standard, traders and investors often adjust the inputs depending on their preferred trading timeframes. Another potential tool for your trend-finding arsenal, especially for traders with a one- to four-session outlook (aka "swing traders"), is the Parabolic SAR. The “SAR” in Parabolic SAR stands for “stop and reverse,” and the indicator is designed so that when a security is in an uptrend, the indicator is plotted below the price, in the form of a dot. This dot is the theoretical “stop” in the stop and reverse, the point at which, if the price touches it, the trend may have changed. When this happens, the SAR is then automatically plotted above the price – indicating a down trend is in effect. 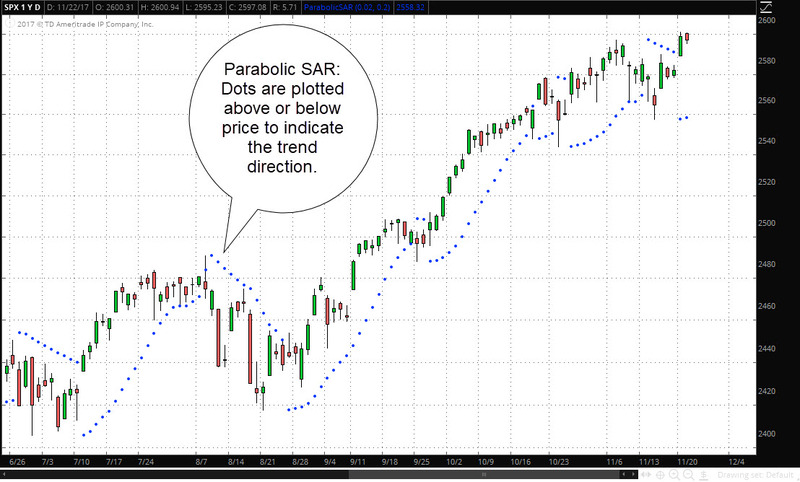 FIGURE 4: SPX DAILY WITH PARABOLIC SAR. The Parabolic SAR, in the form of a blue dot, is plotted above and below the daily close of the SPX to indicate the direction of the trend. Image source: The thinkorswim® platform from TD Ameritrade. For illustrative purposes only. Past performance does not guarantee future results. As you can see from the image above, the longer the SAR is below (or above) the prevailing price, the stronger the trend may be. Like all trend-following indicators, the inputs for the Parabolic SAR can be customized, and can be used with any timeframe. However, on short-term timeframes, the Parabolic SAR may be more susceptible to false signals (what some traders call “whipsaws”). These are just a few of the indicators you can choose from when trying to identify and analyze trends in your trading and investing. They can be used as stand-alone indicators or in conjunction with others. But whichever manner you wish to use them, make sure you take the time to familiarize yourself with each in order to find the strategy that works best for you.